I like to think of myself as a professional picnic-er. I got the whole set-up: the compartmentalized wicker basket, the cute little glass jars, the blanket. As the season for al fresco dining draws near, my body just wants to be outside in the sunshine while I eat. I actually made this salad up years ago after an inspiring trip to Marrakesh. Although my version is quite different from the salads I enjoyed there, the spices, colors and mix of veggies and dried fruit certainly evokes the feelings of Morocco. 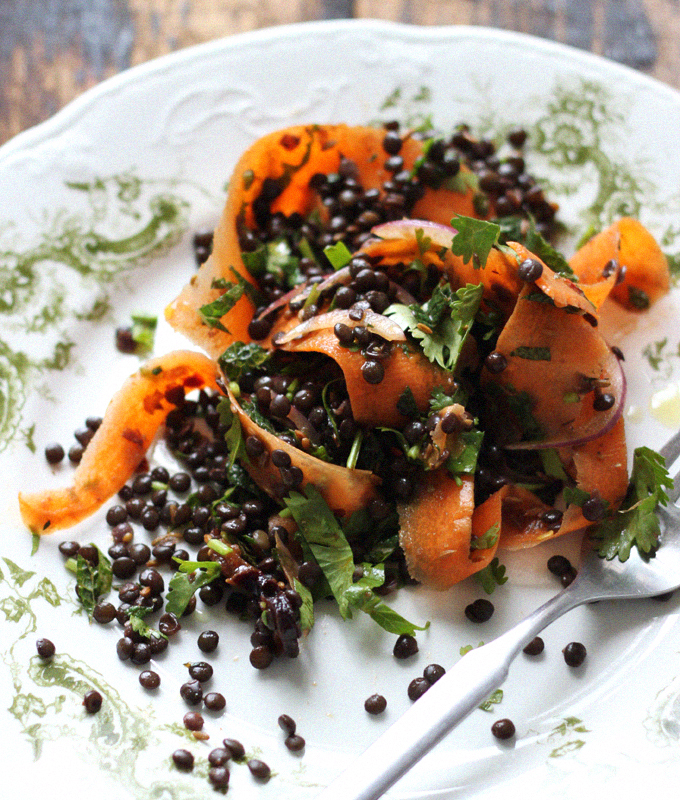 Moroccan Carrot Ribbons and Black Lentils makes for perfect picnic fare because it can hang outside of the fridge, tastes better after a few hours, and there is nothing to fuss with on arrival. No assembly required! Simple, delicious, and satisfying – my kind of food enjoyed both inside and out. Carrots for Eyesight – Fact or Fiction? When I was a kid my parents told me two things: that eating the crusts of my bread would make my hair curly and that carrots were good for my eyesight. Once I realized that the crusts of bread would certainly not give me the head of hair I longed for, I of course questioned the carrot claim too. Turns out, that one is definitely true. 1. Whisk the carrot marinade together in large bowl. Wash the carrots and using a peeler, peel long strips lengthwise and place in the bowl with the marinade. Let sit while you make the rest of the salad. 2. Soak the lentils first if possible. Drain and rinse well. Cook the lentils according to the package instructions (about 20-30 minutes) with a few pinches of salt, just until al dente – be careful not to over cook them. Drain and lightly rinse. 3. While the lentils are cooking, make the dressing. First, toast the cumin and anise seeds in a dry skillet over medium-high heat until fragrant. Remove from heat and using a mortar and pestle, give the seeds and rough grind (this is optional). Add all remaining dressing ingredients, whisk well. Add the warm lentils and marinated carrots, including any leftover marinade. Slice prunes and onions thinly and add. Add washed and chopped herbs. Season to taste. Serve. Haha my parents told us that the crusts of baguette would give us large breasts. Didn’t work out. Will try the recipe tonight. I wanted to send you a very small observation in order to thank you again on the precious guidelines you’ve discussed on this page. It was quite extremely open-handed with you in giving without restraint precisely what some people might have made available for an e-book to end up making some dough for their own end, and in particular seeing that you might have done it in the event you wanted. Those good ideas in addition served to become a fantastic way to fully grasp the rest have the same dream just like mine to learn a good deal more related to this issue. I think there are many more enjoyable opportunities in the future for people who see your blog post. Thank you for every one of your labor on this web site. Betty take interest in making time for internet research and it’s really simple to grasp why. All of us hear all regarding the dynamic way you create sensible thoughts by means of this blog and as well as recommend contribution from other people on that issue so our princess is actually becoming educated a lot of things. Take advantage of the rest of the year. Your carrying out a great job. Thank you for this article. I’d also like to say that it can possibly be hard when you are in school and starting out to create a long credit standing. There are many learners who are simply trying to make it and have a lengthy or beneficial credit history can often be a difficult element to have. I have the benefit of the efforts you have place in this, recognition for all the enormous blog posts. A number of you could possibly inquire how do God have nearly anything to complete using this type of guy staying saved. Nicely God realized that for those who created this one particular shark it could save this mans life, also he created this shark in such a way that it was designed excellent. Excellent indicating he created it in order that it will do the proper point with this situation. I am eating this delicious salad at my office desk as I type this comment. Thanks so much for the recipe! Love the prunes! Thanks so much for your recipes! I wondered if I can sub out the prunes with anything else — do you have any ideas? My mom tortured me with prunes when I was a kid and I will never, ever eat them again! Pingback: Marrokanischer Karottensalat mit Belugalinsen | Oh, wie yummi! Pingback: Emptying my Pocket, Vol. 2 | every moment's a little bit later. Look delicious and easy to make! Thank you so much for your helpful advice, I’m very new and I’m trying to find my way. I can see my mistakes on my photos but sometimes I don’t know how to fix them. Wow that is SO pretty. AND it’s based on two of the healthiest foods my children are eager to eat… sounds like a winner! I love lentils and can’t get enough salads. This one looks perfect! Didn’t have prunes or OJ in the house, but it was still delicious! I love your blog and all your information. Your pictures as always are beautiful. It’s so wonderful that we have people like you spreading empowering information about health! This salad was sooooo good. Making it again for a picnic this weekend! Yum! Will make sure to try out this recipe, sounds very good, especially the dressing. Thanks for sharing another wonderful recipe. Hi Sarah! I have been following your blog for a while. I am truly amazed by what you accomplish with food. It’s so inspiring. I’m a single gal on a budget. In other words, I eat almost entirely processed foods and have very limited kitchen supplies. Have you ever compiled a list of all the kitchen tools you use? Everything from bowls to blenders? I realize that’s probably a huge list but I’d love to see what someone like you has in their arsenal and also would love recommendations for what I should save up for first. Made this recipe today – a double batch because I knew you wouldn’t fail me! It was delicious. In addition to your beautiful and tasty recipes, thank you for the thought you put into each post; I always learn something. Yum – so simple and the lentils make it seem hearty! Kismet! I just made a salad with carrot ribbons yesterday. I used one purple carrot and two white carrots, it was pretty and tasty. Thanks for the caviar lentil inspiration! what a GORGEOUS salad! oh my gosh! i love making carrot ribbons! thanks for sharing! So breezy and perfect for summer. Love the infusion of herbs and citrus.